This topic is a very important one for all monkey caregivers to know about. Many of you may feel pulled by other people’s beliefs or opinions about what is the right way for you to tether your monkey for safety. Networking on Facebook groups and other internet networks is absolutely wonderful for learning about how other monkey owners live with their monkeys but when it comes to a controversial subject like this, the lines can be drawn by judgments and opinions. It is my job to give you the facts about this subject so you can draw your own conclusions. 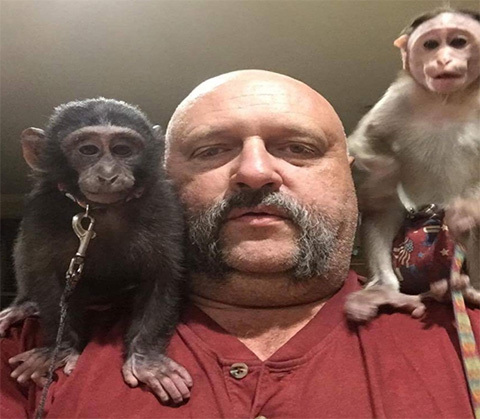 When a new monkey arrives here at SunShine MonkeyShines and I have had the time to be able to get a feel for how they are going to behave with me and the troop, I then decide what type of safety equipment that I will be using for them. The equipment must match their behavior and manners. When making my decision about what equipment I will use, it also helps me to know what prior safety equipment was used with them. It is a special time of discovery not only for the new monkey but to all of us as well. 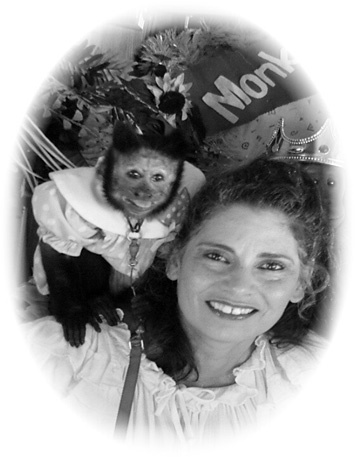 In the book that I wrote called, “Living With Monkeys“, I talk about my early life when I first became a monkey caregiver. The man that started me out was very strict in his education about neck collars, leads, and how to use them safely. The next statement was said to me often, and now I would like to share it with you. Of course, I know now that belly bands and harnesses can also be added to our list of safe ways to tether our monkeys. It really depends on the level of safety that you wish to have and where you are going to spend time with them. 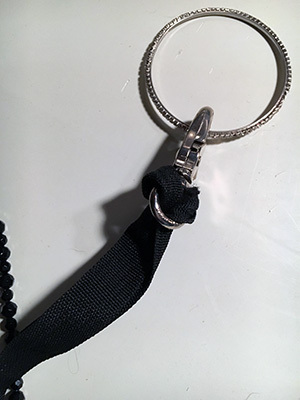 If you have a monkey that pulls on the lead excessively and does not respond well with a belly band, then you may consider changing them to this type of tether. The reason that I choose to use these on some of my show monkeys is that the children at my shows are not always trustworthy. With a neck collar you have control that you do not have with a belly band. When you are around people with your monkey and you are using a belly band with a lead, the monkey’s reach is twice as far due to them being able to reach from their belly area where the tether is located. The response time to a problem with your monkey is delayed because you are not able to bring them under control. With a neck collar you have instant control of your monkey without any delay. Story Time: Sissy has been going with me to the presentations for seven years. I have only had to use her neck chain to prevent an injury from happening one time, but I am thankful that I had it on her when the incident occurred. After I had finished the end of the show, I decided to allow the children to meet Sissy and get a photo with her. So, when we were finished the grandmother came up to sit next to me on my extra stool with her eight month old grandson to get their photo made. When Sissy came over to sit on the lap of the grandmother for the photo, the baby seemed to be just fine with the monkey sitting on her leg but then suddenly the baby chose to kick Sissy with both feet. There were six quick kicks. In the past when a small child begins to show fear, Sissy and I just move away from the parent with the infant. Most children will give you an indication of how they are going to respond to the monkey even before Sissy goes on the parents lap. However, this was not the case with this infant nor did the grandmother choose to keep the infant from kicking her. Things started to happen quickly and I realized the child was going over the line with Sissy. This was an event that had never happened before. Of course, a problem was averted due to the fact that I had Sissy’s neck collar on. I had control of her in one second when she began to move towards the child If she had only been wearing a belly band I would have not been able to share with you about the positive outcome of this story. “Safety-First” has always been something that I have lived by when sharing my monkeys. I feel so thankful for my time with Kermit Matthews, who was my first teacher of how to be with monkeys. 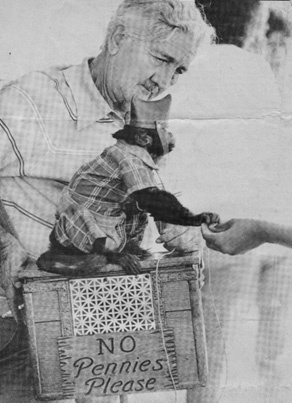 He was one of the old time organ grinders who was still going out to the fairs and festivals with his monkeys. He instilled in me the importance of being safe at all times with my monkeys. 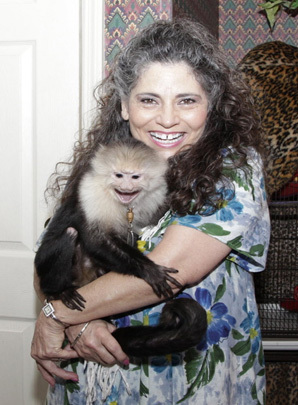 To learn more about my 30 years of living with monkeys; please order your copy of my book called “Living With Monkeys.” This book is offered for sale under books for sale o www.primatestore.com. It took time for Sissy to begin to trust again. 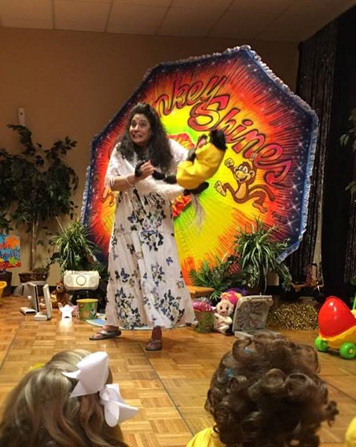 I was so thankful when she was able to put this event in the past and she was once again happy to share herself with the children. There was nothing for me to do but to give her time to heal. She is an amazing little girl who will forever be a gift in my life. She is delightful and loves to give out her special monkey hugs often! Of course, I decided to make changes in how we do photos with the infants. I hope this story will help you understand how important that a neck collar can be. Being able to have control of your monkey is a very important thing. For me, it is the greatest loving thing I can do for my monkeys when they are around people and for the people that I visit with. 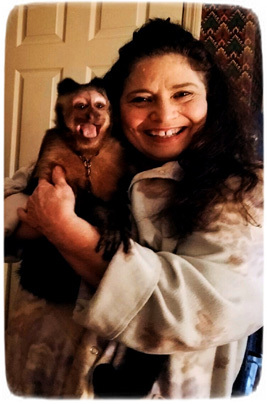 Having instant control over a monkey who is fearful, stressed out, knows no manners, or who may have forgotten all of his or her early training is a very important thing. With a neck collar you have the control and the monkey knows this instantly as they go from a belly band or harness to a neck collar. Remember It Is Always Your Choice To Use Or Not Use A Neck Collar: You are the one that is in control of your decisions about the level of safety that you wish to practice with your monkey. It is your monkey and you know what is best for you. As your monkey is getting older, you will know when it is important for you to have full control of him or her, and then you may choose to make a change. I do not need to tell any of you when this time is needed. Every monkey is different and every situation is different. Please make your own decisions about what is best for you and your monkey. When You Choose To Be A Monkey Caregiver Your Own Judgment Is What Counts: You will be the one who is living with the outcome of your own decisions. Other monkey caregivers are there only to give us options to choose from, as I am doing now. If we are criticized or deleted as a friend by people who are upset with us over doing what we feel is best for us to do with our own monkey, then it is for the best that they are not there to help in the future. 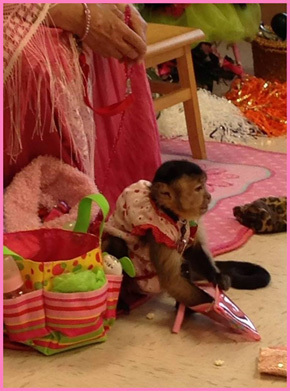 There are many other experienced monkey caregivers who will be there to give you helpful options for you to choose from when problems arise as you are raising your monkey or helping you with a re-homed monkey. Every person’s life and experience with their monkey is always going to be different and because of this we need to be flexible and listen for the pathway of peace to guide us the best way with our monkeys. 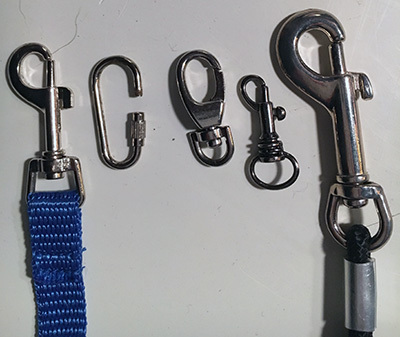 Remember, a neck collar can be taken off daily by a quick snip of an s-hook with a small hand held bolt cutter and then you can go back to using a belly band or harness. Because my early training in having monkeys in my life came from several of the old school organ grinders, they never thought to take the neck collars on and off. They left them on all of the time. But now I have found that it is best for me to take them on and off. What Are The Negative Things About Using A Neck Collar? When I decided to begin taking the neck collars off of my retired monkeys, I learned that the monkeys who had worn their neck collars had permanent hair loss under and around their neck chains. None of my early educators had told me about this happening because I do not think that they knew this. They certainly did not know about other types of tethers or about using belly bands. Their own education had been passed down to them and this was just the way that it was done. I am so glad that my business partner Jesse Moore found a talented person to make neck collars which are made from parachute cord. He knew how hurt I was that the hair had been lost from my few monkeys who had always worn their neck collars so he started his creative mind working and came up with what he felt would be best to solve that problem. When we have been programed to do things in a certain way, sometimes we need someone to say to us, “It is okay to do it different or it is okay to start over with your monkey. I am so thankful for Jesse’s friendship, knowledge and his creativity. It has been wonderful to have two minds working together on safety issues and so many other things with the monkeys. Other than the hair problem, I have never heard of an accident happening with a properly made neck collar. I am thankful that I have these for my show monkeys, and I never have to see hair loss again. They give me peace of mind when I feel that I need the extra control. Silly Willy loves his belly band and there has not been a reason for me to change him but in the past I did consider putting him in one so that he might be allowed to walk around on the floor when he is doing his part of opening our presentations. Because I did consider doing this, I found a new type of lead to help me teach him and Pixie to get used to having a tether around their neck. I just love this lead. 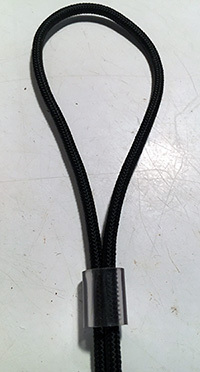 It is a dog groomer lead that is from tip to tip 23 inches long. 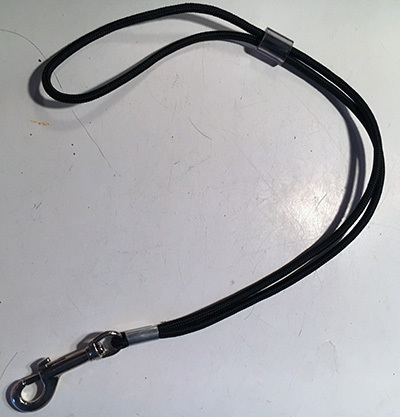 To order a lead like this it would be called a 24 inch lead. It does not have the type of safety snap that I like to use on the end of the lead but this lead is only used inside of my home. My monkeys are all used to having this lead put over their head and then tightened up around their waist with the slider as pictured below. I use this also to sleep with my monks so they are close to me and not crawling all over the place when their awake and I am not. By the way, this type of lead is so much faster to put on. Pixie is a jumpy little girl and enjoys her time out of her belly band and in her removable parachute cord neck collar. However, Silly Willy did not want to have anything to do with any type of change from his belly band tether – but that was definitely not the case for Pixie. She loves to show her skills in entertaining the children, and her jumping and playing has now become a safe thing for her to do as she is a distance away from me. Silly Willy is perfect just the way he has always preformed for the audiences, and I am okay with him giving me hugs and sucking his thumb while I teach the audience how to be around a monkey and many other facts. He loves to swing with his tail too. When I decided to switch Pixie to a show neck collar, I used the grooming lead to teach her how to be comfortable with something around her neck. It worked perfectly. She knew from the beginning that I was going to take it off and on just like I did with her belly band. She now knows that when it is time for me to put her neck collar on she is going to be a show off. If you were to decide to change your monkey into a neck collar, then this groomer’s lead is very easy to use. You would first get them used to seeing the lead and then the next step is to start teaching them to have the lead opened up and put over their head and then down to their waste where you place a belly band. When you begin to be successful with them using the lead and feeling you pull the lead up snug around their waste then the next step would be to start working with them to get comfortable with the lead going over their head and then feeling it being tightened around their neck. You will know just as I did if this change is even possible for you to make with your monkey. Many monkey caregivers will sometimes choose to place the neck collar on their monkey when they are having a check up with their monkey’s veterinarian. 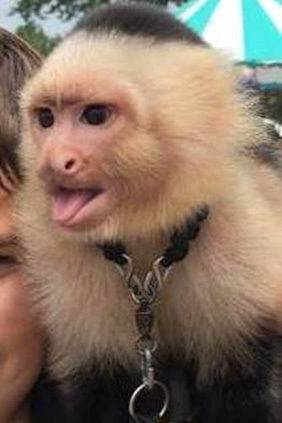 If I felt that I needed to put a neck collar on a monkey for behavioral reasons and I was not sure that I could get the collar on them then this is what I would do. WARNING: Please Remember This Grooming Lead Is Not An Outside Lead: These are only for inside. The monkeys need other types of leads and tethers when they are outside of your home or if you’re outside doors are being opened and closed often while your monkey is out of his or her enclosure. STORY TIME: Silly Willy allowed me to know that he did not wish to have contact with children when he was around three and a half years old. He did not do anything to a child but he did flex his muscles and make me need to tighten my hold on him to keep an accident from happening. From that point on he has never had a child in his safe space. This change in him happened over night. I did not have any prior signals that he was changing his attitude towards the children. I knew there would be changes in his life as he grew up but I really was shocked that he stopped liking the children. For the first years and months of his life, he seemed to love having everyone pet him. After he changed the only thing that I could do was to keep everyone at a safe distant from him. He is not a biter or anything like that but as a monkey caregiver, I had to do this because it is my job to do so. Accidents can and do happen unexpectedly with our monkeys. Just because I had a monkey unhook the pull down snap on his lead and be gone for 28 hours in freezing weather does not mean that the same thing is going to happen to you. But, because your being a good listener and reader you have now found out that it is possible for this to happen to you with your monkey. I now know that anything is possible when you choose to be a monkey caregiver. To me these are all not safe types of snaps. I lost Andy years ago for 28 hours during the Christmas holiday time due to him being able to pull down on the side bracket of the snap which was on the end of his lead. He had never shown me that he could do this before he escaped on our 32 acre farm. That night temperatures dropped down to 23 degrees. So, this event made me change to the scissor type of snap. I knew that I never wanted to chase a monkey ever again after this experience. To me these are not safe. STORY TIME: Many years ago I did not use the bracelet or the scissor type clip. What led me to make the change was, I actually let go of the lead handle for one of my special little monkeys named Polly-Wally. Of course, it was an accident and I was quickly able to stop her from her decent into the jungle area of Florida. This made me make an important safety change. Polly Wally was a special little monkey. Her story was sad with a happy ending. She had been purchased by a family with children and one day they allowed her to get loose outside with her lead on. When they found her three weeks later she was at deaths point while being wrapped around a tree with her lead. So, I am sure you can understand my feelings of panic when I allowed the lead to drop. From that day forward, I was a changed monkey caregiver about how I had to have the leads connected to me at all times. This is my “Safety-First” bracelet with my scissor type snap. This gives me piece of mind that I will not drop the lead. 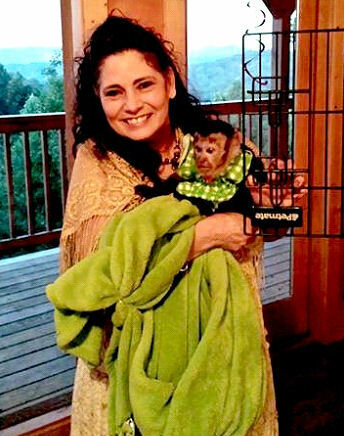 Dropping A Lead That Is Connected To Your Monkey In Today’s World Does Not Need To Ever Happen: With all of the laws and negativity centered around monkeys, I have turned into a huge “Safety-First” type of monkey caregiver. My Polly only was three feet away from me during the time of my story but I will never forget how it felt during those seconds of her being loose. I knew that this could never happen again. I hope you will take my advice on doing this. Thoughts To Share: None of us wish to make a mistake that might cause an accident or do something that will take the life of our monkeys or other loved ones. The only way that I have been able to deal with the loss of many of my beloved monkeys is to believe that every living thing on this Earth has a timing of when they come and when they go. We all wish we could control this truth and never lose our loved ones but it is just not possible. 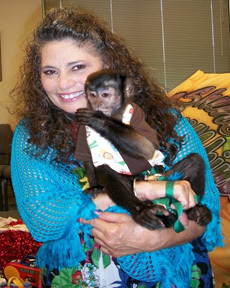 Please trust the peaceful guidance that you will receive when you are making decisions about the care of your monkeys. If you cannot get to that peaceful place, then wait to make your decision. It may be that you are letting the fearful voice inside your mind block your guidance. I wanted to share the next photos of a company that makes some amazing body bands and leads with swivels on them. 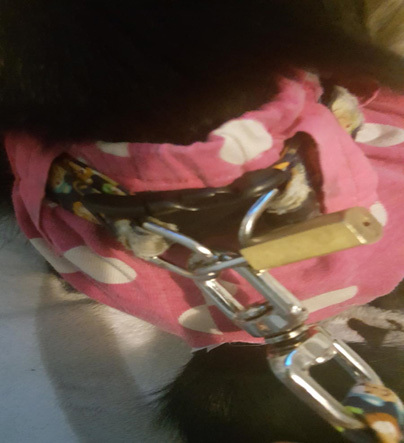 Jamie is showing us in the photo how she has taken one lock to connect the end of the lead swivel to the two safety rings on the belly band. Thank you Jamie for sharing your photos with all of us. Once again these are made by maltipaws. For Extra Safety You Could Also Add A Heavy Duty Black Electrical Tie To The Three Rings: Just remember not to cut the extra part of the black tie off to close to the end of the actual tie part. I have found that they are safest if you cut them by leaving a fourth of an inch from the closure of the tie. 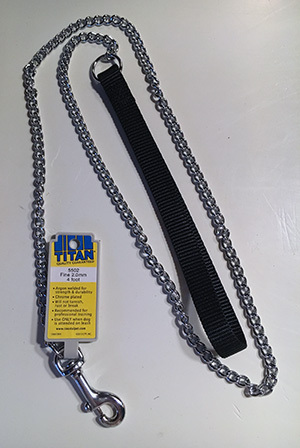 If you choose to try a neck chain then the company named Titian is a wonderful company who makes some great chains – and leads. This company’s products are the best for strength and trustworthiness. I especially like to use their leads with Silly Willy. He loves to chew everything and has the teeth to do it with. This is the lead that Silly Willy must use due to his big teeth. The snap of course, is changed to the scissors type snap and I attach a swivel to the handle and then connect it to my bracelet. This is a Titan product. 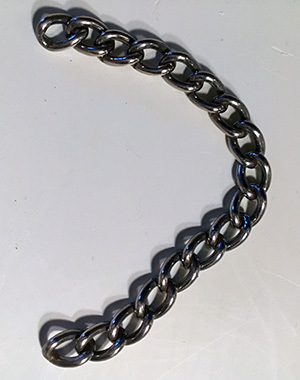 This is the welded link chains that a neck collar can be made from. 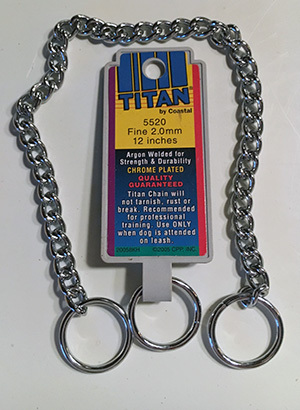 Titan products are sold at Pet Supplies Plus and many other stores. 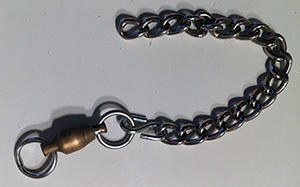 Purchase your desired weight of welded link chain, your s-hooks to fit into the end link of your chain and your swivel. If you are putting together a neck collar for a large monkey your equipment that you purchase will need to be larger. It all depends on the size and type of monkey who you wish to make a neck collar for..
You never wish to put a neck collar together that is to heavy or on the other hand, one that is not strong enough for the monkey that you are choosing the equipment for. I have put together two different sizes and photographed them below. 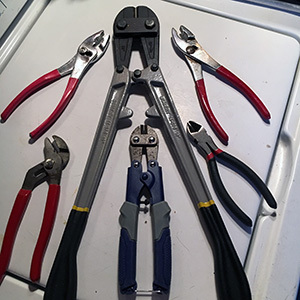 These are the tools that I keep available to make a neck collar or tether. When you are working with strong s-hooks and chains you will need these. I have found that keeping the large type of bolt cutter is a very important tool to have when caring for monkeys. These are the large and small s-hooks that I chose to put the two different neck collars together with. 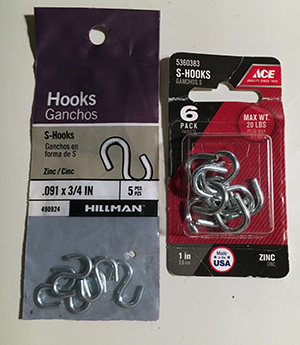 I have had good luck using ACE Hardware s-hooks for many years. These swivels have been modified so that they have larger circles welded on either end of the barrel of the swivel. They are strong ball bearing swivels and are made by Sampo. 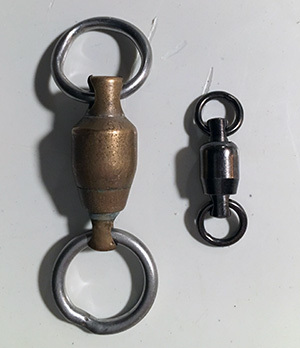 I just happen to be out of the smaller size of these swivels but you will be able to see the size of them on their website. The small swivel in the photo is also a Sampo swivel. As you can see the rings are very small on the end of the smaller swivel. It makes it hard to put a lead on these smaller ones. That is why I really like the Northwoods Falconry swivels so much. WARNING: I must get very clear about swivels. It is very important to put a neck collar on with a swivel. This way you will always know that your monkey has a swivel on if you were to put a lead on them that does not have a swivel. This piece of equipment is very important for the safety of your monkey. Without a swivel your monkey could be chocked or become wrapped up in their safety equipment. The proper size and weight of the swivel in which you choose is very important. Just because it is a fishing swivel that does not mean it is safe enough for a monkey. A monkey is constantly moving and pulling on a swivel. Please use discernment when choosing your swivel. You do not wish to put a swivel on your monkey that is to heavy but you also do not wish to put a swivel that is not strong enough. The metal can work through light weight pieces of metal when you attach a s-hook to the swivel in a short period of time. You begin by using your small or large bolt cutter to cut your chain a little larger than you think you will need it to be. The size will be adjusted later in the process of putting it together. On one end of the chain attach your chosen s-hook size to the top ring of your swivel. Now use your pliers to close the s-hook down on the chain and the circle on the top of your swivel. Take another s-hook making sure it is in the same position as the other s-hook that you have just closed down on the chain and the circle on top of the swivel and now connect only the bottom part of the s-hook (with your pliers) to the top circle of the swivel. You will be leaving the top part of the second s-hook open. The reason that you are doing this is so you can size your chain properly before you connect the last side of the s-hook.You may have to use your large pair of bolt cutters to keep taking links from the chain so that you can get a perfect fit. To me a perfect fit is when the neck collar will not go over their head and there is still a nice amount of space tor it to be comfortable for the monkey. When you get the size of it just perfect then it is time to place the opened neck collar up to your monkey’s neck and then put the s-hook into the last link of your chain. It is important to not allow the chain to be twisted. It must be smooth and flat against their neck. I like to pull the collar around to the back of the monkey’s neck and close down the s-hook with my pliers so it is safely on your monkey. I never wish to frighten a monkey with seeing the pliers or cutters coming towards them so this is another reason for turning the neck collar around. This is a new experience for you and the monkey and both of you could be very nervous the first time. The easiest way to snip the neck collar is to cut the last s-hook that you closed down. By doing this you will be able to snip the rest of the s-hook from your neck collar and then be able to put the neck collar back on again if you choose to do this by simply connecting a new s-hook.When you choose to use a smaller weight swivel that has a small circle at the bottom of it then you can add an additional s-hook to the bottom circle of your swivel and connect a larger circle to accommodate your safe type of lead. This is the small neck chain that I put together. This is the large neck chain that I put together. These are the type of neck collars that I use on the monkeys who go with me to the presentations. If you wish to try these types of neck collars you will need to find someone to make them for you. There are many people that make these for dogs and they will work with you in making this type of neck collar. Just make sure you have a safe loop made at the end of each side of the collar to attach a s-hook to it and close it down. The ends of these neck collars have the ends made where the s-hooks can be put through them. 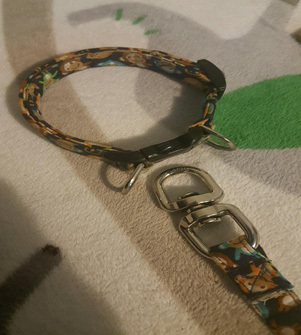 In the following photos you will be able to see that these parachute cord neck collars are put together just like the chain collars are put together. The big difference is that you must make sure the size of your parachute cord collar is made correctly for when you put your s-hooks and swivels on the collar. You may wish to put a chain neck collar together with your s-hooks and swivel and measure the chain part of your collar and order your neck collar from this measurement. Just Like With Clothes And Diapers: When there is a change in your monkey’s size, you must also change the size of their safety equipment. “Lizzy (age 2) and Louie (age 5)” playing outside. “Louie” is also wearing a parachute cord neck collar for his safety. 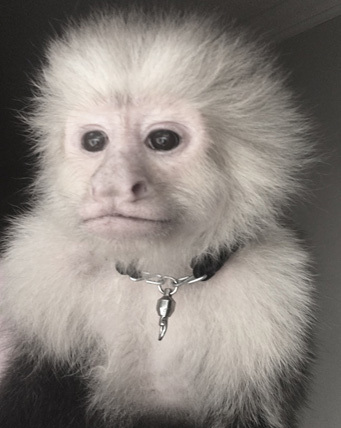 I have had one monkey come to me with a small plastic link neck chain on. It was doing the job for his previous owner but he only kept the monkey inside of his house. He was changed to a belly belt when he was with me. This monkey has also been spoken about many times in my posts. His name is Casper. By the way, he did not have a swivel on this plastic neck tether. This is always a big NO! 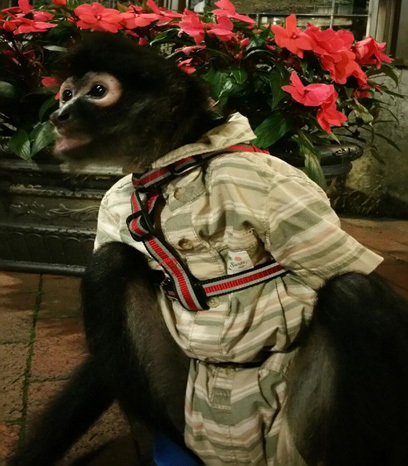 It Is Not Safe For A Monkey To Not Have A Swivel On A Neck Collar. This type of neck collar can be used in home environments. Man people who have been comfortable using these on the necks of their dogs will also use them for their monkeys. Roy is showing the two different types of tethers that he has chosen to use. Thanks Roy for sharing this photo with us. As with any type of neck collar it is very important to size them properly. The last thing we ever wish to happen is for a neck collar to come off over their head especially if you needed to bring them quickly under control during an emergency situation. This is absolutely not the time for you to have a failure with an improperly sized tether. This type of tether is not a neck collar or a body band. It is a chest type of harness. 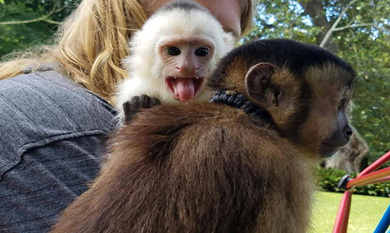 I personally have never used one of these on a Capuchin monkey but as you can see from the photo below; this type of tether works very well on a well behaved larger monkeys. Margaret is showing us how she uses a dog harness for her monkey “CJ”. As you can see she is also using a belly band on him for extra safety. Thank you Margaret for sharing these photos with us. As you can see from these last photos; it is great to create your own combination of your safety equipment. I am encouraging you to get creative. All people with monkeys to not take their monkeys out into public and to only keep them inside of our homes. This is a great idea but we must be realistic about people choosing to do this and that is why I have begun teaching “Safety-First” type of equipment and proper education to provide all monkey owners with options, and truths about what they are risking when they take their monkeys out into public. We As Monkey Caregivers Have A Responsibility To All Other Monkey Families To Keep Our Monkeys Safe. Warning: Every Time An Accident Happens With Monkeys Across The USA, It Makes A Lasting Mark Against Our Ability To Have Monkeys In Our Homes. Learn How To Be Safe And Do Not Turn Your Monkey Over To Anyone Who Is Not Properly Trained With “Safety-First” Type Of Training Which Is Offered On This Site. You do not become a trained person who wishes to entertain or show your monkey in public overnight or how to take your monkey safely in public while you are out at a park. It takes time to learn how the public will react when they see your monkey. It takes time to learn that it is not safe for you to drive up to a take out food window with your monkey out of the cage. It takes time to learn to never leave a lead on your monkey in their enclosure. It takes time to learn to put your monkey’s safety needs first. None Of Us Monkey Owners Wish For You To Find Out About Safety Issues By Loosing Your Monkey: It requires you to network with other monkey people and to read and study helpful information so that you will know what is a safe way to present your monkey in public, and in a limited way. It takes time to learn what is safe and what is not safe. It Is Not A Good Idea To Rush Anything Centered Around A Monkey: Getting the education takes a long time. If you rush and do not do your homework then you possibly could make a terrible mistake with the life of your precious monkey. It is impossible to know everything that might or might not happen to a monkey. There are not any guarantees when you sign up to be a monkey owner. We hope and pray that our pathways with our monkeys are going to be gentle and that there will be no accidents, or terrible sickness but just like with children there are not any guarantees in life. .
Our Monkeys Are So Special To Us: They are not children but it feels like they are. We must always remember that they are animals who are living with us and the world looks at events that happen with them in a totally different way. Because they are animals, many times they are taken away from their owners and then euthanize after a monkey bites or is captured after an incident. Please consider using the best safety equipment and check it for possible malfunctions often in order to prevent an accident from happening. Lock failure is something that can happen at any time when you are a monkey caregiver so it is important to inspect these often. Monkeys can bite locks and cause a change in them being safe. These types of tether devices truly have a place in our lives as monkey caregivers. When used as a backup up safety device on a neck collar or belly band I have found these to be extremely helpful to give me added peace of mind. The ties must be inspected especially after cutting them. With plastic ties you can cut them to close which may cause them to come open.Warning: Never use a plastic electrical tie as your only safety tether equipment. These should only be used as a backup safety device such as pulling two circles together after you have put a lock together. Many monkeys have lost their lives due to people putting electrical cords on their monkeys. Many monkeys can grab the cut end of the tie and then pull the tie up tighter on their bodies. Every time I hear of this happening I am so very sad that the owner did not know this very important information.Plastic electrical ties do not last forever. Over time they become brittle and begin to break apart. Use these with confidence but do inspect them often for safety and make sure you are using these where your monkey can not see them. A monkey with teeth can cut right through them. Swivels allow our chosen safety equipment to work properly. Using these on our monkey’s equipment means that there is movement when using them. These moving parts must be looked at closely to insure safety when you are preparing to put your tether on your monkey.Parts that move on our swivels become thin with continual use. When picking our snaps, with the swivel action on them, it is equally important for us to inspect them closely. Most companies use the regular pull down type of snaps on their leads. I have seen the swivels on these types of snaps break often. I do not like to use this type of snap due to this problem. I have spoken about using these with monkeys who have the ability to figure out how to open the snap already in this post.A swivel is meant to move and turn around. That is its job. Dirt can make them stop working. Clean with WD 40 oil and begin to rotate them when you find them not swiveling properly. All safety equipment must have a swivel working to be safe. 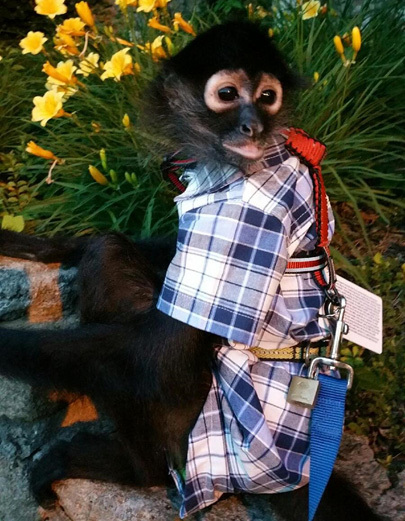 Our leads are being used constantly if you are a monkey caregiver who is concerned about your monkey’s safety. Both of the leads and harnesses are made with different types of fabric, buckles, stitching, and medial snaps. These things must be inspected often for safety.Remember All Safety Equipment Can Change Or Deteriorate Quickly: Check the swivels for free movement. Check the snaps of your leads to make sure they are moving properly, check the stitches, on your leads, check the buckles on the body or neck bands. . Check everything that you use often. Check the screws on cage doors of bird cages that you might be using for your monkeys. Once again, CHECK AND RE-CHECK things that keep your monkeys safe. Doing this has always helped me have added peace of mind. I thank my past teacher for instilling in me the need to become a monkey caregiver who is always looking at things that I use for my monkeys with the belief that tethers, caging, toys, clothing, and even food can change from being safe to becoming not safe. Thank you so much for continuing to read these posts on the Primate Care Site. I hope that I have been able to share facts and offer some good ideas about making your monkey safer when you leave your home with him or her. Good Luck! Thank you for visiting us here at Primate Care. We are committed to bringing good information for you to think about and share with your family, friends, and other monkey caregivers. In the next posting on the Primate Care Site we are asked to answer a question. Are Monkeys Fragile As They Live In Captivity?